This entry was posted in Agents, Editing, Novel, Phreak Show, Pitches, Queries, Writing. Bookmark the permalink. Lucas, thank you for your experience & wisdom. I had a similar experience w/ my recent book. My synopsis came out w/ more ease than usual. For me, writing is fun and comes easy… all that after stuff– the synopsis, the query… all business (the stuff that is really a chore, but one we must tackle if we want an agent to look at our work!) For my most recent book, I got an agent to say it sounds good but he wants me to cut back the length of the book before he reads the whole thing. Cutting back is so much more difficult than creating. But, I have to say, I’m happy with the revisions so far. Wish me luck & luck to you also!! The writing part is definitely the ‘funnest’ aspect, but the other pieces are just as essential. If the goals for writing are 1) Tell an amazing story only you can tell & 2) Share that story with the world, then the more businesslike aspects are just as important. All the g’luck on the revisions! 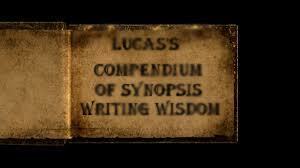 “If you find it difficult to summarize your story in synopsis form, your story may be inherently flawed.” – I definitely agree with that statement! And that is why my the plot of my WIP is about to undergo extensive surgery. Sorry, but I just noticed a word that shouldn’t be there in my previous comment……stupid keyboard error. Fabulous blog though, Lucas. Wield that WIP scalpel like a psycho surgeon!